There are so many mornings when I wander bleary-eyed into my closet and stare at the clothing zombie-like with zero motivation to be creative with my outfit. I just want to get myself dressed and out the door quickly while still looking presentable for work. This brain dead “I have no idea what to wear” scenario is when I depend on my tried and true “outfit formula” that was deeply ingrained into my wardrobe psyche by Stacey & Clinton during my many years loving to watch TLC’s What Not to Wear. The formula says: basic piece + interesting piece + cardigan/jacket/completer piece = outfit. This is forever the formula in my brain for getting dressed for work while looking reasonably put together. Over time that general WNTW formula has developed into a few specific formula patterns in my wardrobe. And since I use this method so regularly – I thought it would make a good set of infographics to share here on the blog. I’ve been going back through my blog archives to grab some outfit examples of each of those specific formulas I use to share with you. 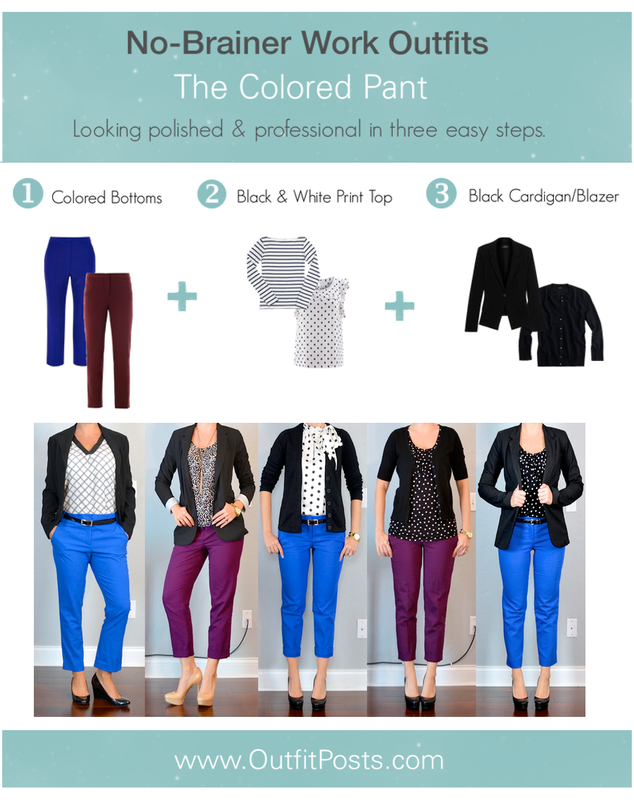 This outfit starts with a pair of colored pants. First, for the bottom, choose your pair of colored work pants. 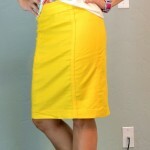 (Could just as easily be a skirt.) The two pairs I own are cobalt blue and burgundy. Next add a neutral printed top. 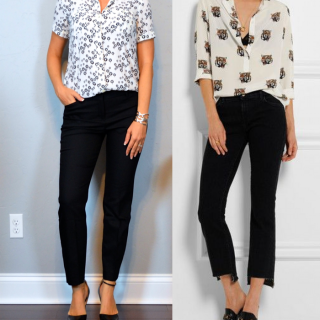 I like black and white tops because they are super easy, can’t go wrong matching the colored pant choices. They can be basic camisole/tanks or bonus points for texture with a tie-neck or ruffle on the shirt. Finally, I add a black blazer or cardigan to further tone down the colorful bottom half of the outfit. Easy peasy professional. When I get dressed using this formula I’m not trying to be a fashion standout – it’s just more about looking presentable for work in a hurry. So there is no need to figure out an amazing statement necklace or perfectly coordinating scarf. The pants are the pop in the outfit and everything else is background. I feel like this outfit formula can easily be used over and over again for pulled together professional looks for work. Just sticking with the same blueprint and switching out the individual pieces – the outfits possibilities are endless! You can find all “formulas” I’ve posted using this link. I am a relatively new follower and I want to say that I love your blog. I started reading because of your “one suitcase” posts, but now look forward to getting outfit ideas on a daily basis. You look great for just having a baby. And, remember, it took nine months to grow the baby and it takes about nine months to lose the weight. I always carried 15 extra pounds until I quit nursing and then the rest would just drop off. Keep up the great work! I keep the WNTW formula in my head when picking out my work outfits, too! Gosh, I miss that show! And, I know what you mean about wearing so many colors and feeling like you came out of the crayon box. I work in the corporate headquarters for my company and even just wearing a colorful cardigan as my completer can feel like overkill when I'm in an elevator with all men in black and gray suits! Bright colors are definitely harder the more corporate formal the environment!